Scripted lessons refer to highly structured, pacey lessons with specific time allocations for tasks and word-for-word scripting for the teacher. These are most often used to teach early reading where the most effective instruction is highly structured and systematic. Scripted lessons face fierce criticism in education. Critics say they stifle teacher creativity and fail to acknowledge teacher expertise. In other words, they fear scripts deprofessionalise teaching. I do not agree with the critics. Scripted lessons do not deprofessionalise teachers in any way. It is not ‘robot teaching’ whereby the teacher mindlessly reads the words on a page. Scripted lessons do not mean you do not assess your learners and make necessary adjustments. Good scripts make the need for formative assessment very explicit. In fact, this is one of the greatest benefits of scripts – the teacher spends less time laboriously planning lessons and more time assessing students and advancing learning. Just like in any other lesson, highly knowledgeable, experienced teachers are needed for effective teaching to take place. The script does not teach the child, the teacher does. Robot teaching is a wildly misinformed view. Scripted lessons vary in their level of detail and scripting depending on the desired outcome in a lesson Teaching a new concept requires a teacher to explain, demonstrate, model and combat misconceptions that may arise. In this case, word-for-word scripting is not ideal or appropriate. Instructional routines, on the other hand, which are pacey and oft performed, are highly scripted as this is the most effective way to execute pacey routines. Instructional routines are perhaps the best example of how useful scripting can be. I use a script every day when we do blending drills. My self-made script is highly influenced by routines used in Read Write Inc. and MultiLit. My blending drill immediately follows an LS correspondence drill (also scripted). Teacher: KK we are going to practice blending our sounds. Point at the individual sounds above the card as the students blend and say. Repeat routine for desired amount of words, dropping the ‘special friend’ prompt and pointing prompt over time. Assist and model where necessary. Teacher: [Praise students] time to sound out in your head! Now show the flashcard for the desired time. Push forward to signal the students need to say the word. Continue for desired amount of words, picking up the pace over time. This is a very simple example of a scripted routine. It is pacey, engaging and challenging. While executing the routine, I am constantly running a narrative. Often times I am challenging students telling them I’m going to trick them (I almost tricked you Barry!) or I’m praising lavishly (Wow! wow! wow! Debbie’s today’s superstar so far!). Every couple of days I will draw a funny picture on a card and slip it into the pile or place blank ones in there and act as if I didn’t know it was there. Put it this way: the routine is definitely NOT disengaging. Some may argue that because I have made this script myself, there is no need for me to use commercially produced scripts. That ignores the fact I have leaned heavily on world-class scripts (MultiLit and RWI) and assumes all my scripting in every scenario is of top quality, which is highly doubtful. I see scripting as a useful addition to my practice. Instead of spending time planning and resourcing, I could be spending more time thinking about the lesson content, assessment and the behaviour management and engagament strategies I could use. Spending more time on these three things would be much more effective for learning than trying to pull together what I am going to include and what I am going to say. The case for scripts, especially for instructional routines, is clear, so why the criticism and opposition? Probably insecurity. If they ever do get around to trying scripts, teachers will soon find some scripts to be far better than what they could ever produce on their own. It’s an ego check. This is to be expected; good scripts have been created by experts and tried and tested thousands of times. My advice is to just give them a go. Feedback is information provided to a student from a teacher regarding aspects of their performance. Its key role is to reduce the discrepancy between current and desired understanding. Feedback is one of the most powerful influences on learning and achievement, both positive and negative. Because feedback can also have negative effects on learning, Education tends to avoid criticising students in favour of delivering ‘the right kind of praise’. Yet delivering negative feedback does not necessarily mean negative effects will ensue. Rather, the conditions in which negative feedback – and more specifically, criticism – is delivered dictates its effectiveness. No one likes to talk about criticising students. After all, teachers love kids. That’s fundamentally why they enter the job. No preservice teacher is entering the profession to lay down criticism. In fact, the contrary is often the case: teachers enter the profession because they want to empower kids; they want to make their students feel good. Teachers’ unwillingness to criticise is probably also influenced by the self-esteem movement. The self-esteem movement emphasised the importance of one’s self-esteem as it was thought to be at the core of human flourishing. During the movement, criticism of a child was replaced with ubiquitous, often undeserved praise and comfort as this was thought to be effective for building self-esteem. This has likely affected the approach schools and teachers take to delivering feedback to students in the classroom. A teacher may be subconsciously careful not to criticise in order to protect the self-esteem of their students. In my opinion, the self-esteem movement was misguided. Criticism is important. A typical teacher who encounters a student who is beaming with pride at their hard work is only likely to praise them and perhaps offer a ‘what to do next time’. By not openly criticising aspects of a student’s work, the student has to infer what aspects have been done poorly. Of course, the student is unlikely to make this inference from a teacher’s ‘what to do next time’, otherwise they wouldn’t have done certain aspects poorly in the first place. Of course, praise is necessary as long as it is genuine. I am not arguing we criticise in replacement of praise; rather, criticism should be interwoven with praise. Following praise, I think a teacher should criticise. Criticism makes it very clear to the student what they need to improve on. By openly criticising a student’s work, you are giving them clear messages about what aspects of their work are done poorly and need careful attention. Direction on how to improve deficiencies can then be communicated. This seems far more effective than a simple ‘what to do next time’. Yet how does one do this without instigating the potential negative effects of feedback? When asked how the Chinese teachers would respond, there was indeed an interweaving of praise and criticism in their responses. Many began with praise of the student’s thinking, but following discussion, criticism for a student’s perceived lack of thinking ensued, “I will encourage her again for her spirit of daring… But at the same time I will indicate to her that one should not only dare to think, but also learn how to be good at thinking.” The jump from praise to criticism was not back-to-back though. The Chinese teachers responses tended to interweave other elements such as telling, explaining, raising questions, and displaying examples. Ma observed that such thoughtful responses characterised by praise, criticism and high levels of support were heavily supported by the teachers’ subject knowledge. What did the American teachers do? Well, they simply praised then encouraged the student to work on the problem (i.e. a ‘what to do next time’). Herein lies the secret to the lost art of criticising your students: the level of criticism needs to be matched with the right level of support, and a teacher cannot deliver the required level of support if their content knowledge and pedagogical content knowledge are not up to scratch. Knowledge matters not just for content delivery, but for delivering criticism too. If a teacher does not offer the right level of support preceding or following criticism, the student will simply become disillusioned rather than empowered; bitter rather than inspired. If you do not have the knowledge to support your students, do not criticise them. So should we openly criticise students? I say yes, but only if we can match that criticism with the right level of support. Criticism matched with the right level of support can be powerful feedback indeed, much more powerful than your typical praise and next step strategy. I am a kindy teacher and I support the proposed phonics screening check. Accurate word reading at 6 is a good predictor of future success. Current practice in the early years is not focussed on word decoding. It does not ensure all children have the necessary word decoding skills they need to become successful readers in the future. The proposed phonics screening check is a policy proposal for the better as it will focus practice on this crucial skill. Currently, schools adopt a balanced approach to reading instruction. This is a whole language compromise birthed after evidence against WL overwhelmed its proponents. It is WL with bolted-on phonics. Analytical, incidental or embedded phonics are bolted-on phonics approaches as part of a balanced approach. These approaches have proven less effective compared to the systematic synthetic phonics approach, which teaches students letter-sound (LS) correspondences in isolation and how to blend these sounds to decode printed words. This is an evidence-based approach to early reading instruction. The 3 cueing system is a widely used model for teaching and assessing students’ ability to decode new words and is incompatible with an evidence-based approach. It is said that students draw on three ‘cues’ – semantic, syntactic and graphophonic – to decode words. The 3 cueing system has a shady past and no evidence for its efficacy. It encourages students to guess at words from context before paying attention to the LS correspondences in words (It, quite worryingly, reminds me of Goodman’s psycholinguistic guessing game, a theory that posits reading is a series of guesses). Good readers draw on all three cues to read effectively; poor readers focus too heavily on ‘graphophonic’ cues. Fortunately, the evidence shows that paying attention to LS correspondences is key to successful reading and it is, in fact, poor readers who guess words from the context – not the other way around. Charles Perfetti, building on the Van Orden Effect, had children pre-identified as good and poor readers read words in isolation and within a sentence (in ‘context’), and recorded the speed and accuracy of word reading. He found that young readers identified as poor readers were more likely to rely on context clues and had more difficulty decoding unfamiliar words. Children identified as good readers were less likely to rely on context clues and had less difficulty decoding unfamiliar words. The observations are telling: there is a link between attention to LS correspondences and competent reading; using context clues is a habit of poor readers. The link between attention to LS correspondences and successful reading makes the matter clear. Early reading instruction should focus on teaching students LS correspondences and how to blend these to read words. Synthetic phonics is fit for purpose. As mentioned, current practice is balanced and based on flawed models of word decoding such as the 3 cueing system. Practice needs to change to an SSP approach so students have the skills they need to read effectively. Introducing a phonics check will expose the holes in balanced approaches and help the shift to evidence-based practice. In all honesty, I wish the check was not necessary. In an ideal world, the teaching profession would have already adopted an evidence-based approach to teaching early reading; however, as noted, that is not the case. If the profession cannot lead itself then policy action is required to promote the use of evidence-based practice. Otherwise, things are unlikely to change. Many will oppose the proposed phonics screening check despite its efficacy and the efficacy of the practices it is most compatible with. This is to be expected. Many have built careers and reputations around flawed approaches like the 3 cueing system. Reading Recovery proponents are perhaps the best example, yet at the end of the day, reading instruction is not about us, it is about the little kids with dreams of becoming a doctor, a nurse or (to my delight) a teacher. They deserve it because without good reading skills they have little hope of reaching such high aspirations. That’s why we should ignore the naysayers in favour of evidence; that’s why I support the proposed phonics screening check. Should We Be Nice to Students Who Fail? Upon A Level results release (final year of schooling in England leading to university admission) a number of high profile individuals came out on social media to reassure those who may not have done so well. One such person was Jeremy Clarkson, former host of Top Gear. In his tweet, Clarkson tells students not to worry because he didn’t do too well and is now very wealthy. This is a wider reflection of society’s apparent moral imperative to cheer people up when they experience failure. It is linked to the self-esteem movement. At the beginning of the 20th Century, the behaviourist movement placed an emphasis on objective study and suppressed the study of emotions and feelings. The self-esteem movement revolted against this somewhat stale view of humanity and placed more emphasis on the self after Nathaniel Branden published The Psychology of Self-Esteem wherein he claimed self-esteem was the most important facet of a person. The belief that one must do whatever they can to achieve positive self-esteem became a movement with broad societal effects. Criticism of a child was replaced with ubiquitous, often undeserved praise and comfort as this was thought to be effective for building self-esteem. Criticism of the self-esteem movement has grown over time because it has been revealed to be wholeheartedly misguided. It was thought that to raise one’s self-esteem one had to praise and comfort failures so to protect the self-esteem and allow confidence and happiness to be cultivated. Clarkson’s comment is the self-esteem movement in a nutshell. Here we have a man with no doubt the best intentions in the world trying to make light of failure; trying to protect students from its harsh sting. This is misguided. Such an approach often has the opposite effect: by protecting the self-esteem a person may never grow to withstand life’s many trials and tribulations. Hence I do not believe we should be so nice to students who fail. We should not be filling their minds with fantasies of riches as a way to comfort; rather, we should be giving them the raw truth. The truth is life is full of hardships which often lead to painful failure, and avoiding these is simply not a good strategy. Facing these hardships head-on is a much better strategy. “The impediment to action advances action. What stands in the way becomes the way.” (Marcus Aurelius in The Meditations) The obstacles we face in life, no matter how heart-wrenching, are not going to disappear. Rather than tell students that everything is going to be okay, we should be cultivating the mindset of the Stoics. This is the way to deal with life’s trials; it is a call to action; it is a call to work hard and dedicate yourself. So, by all means, meet them with all the compassion and empathy in the world but don’t paint over failure. It doesn’t pay to protect self-esteem. Don’t do it. Primary teachers need two types of knowledge to teach mathematics effectively: content knowledge and pedagogical content knowledge. Content knowledge (CK) is general maths knowledge and ability of the content areas they will teach as well as knowledge of how this content is organised throughout the years of schooling. Pedagogical content knowledge (PCK) is knowledge of key preconceptions, misconceptions, models and best practice for how to teach a particular concept or remediate a misconception. Both are necessary. Liping Ma published her seminal work in 1999 which captured the differences in how Chinese and American teachers may approach teaching a concept or remediate a misconception. This is an examination of PCK. Ma discovered that the diversity and depth of the Chinese teachers’ PCK reached far beyond that of their American counterparts despite the fact that many of the Chinese teachers had less formal training in mathematics. Chinese teachers’ superior CK and PCK is reflected in the results of their students – Chinese students are much more competent at mathematics than their Western counterparts when measured by large studies such as PISA. The teachers’ PCK and CK are two of many factors influencing these results; their knowledge is likely an important contributor to success. Norton posits that if a teacher cannot accurately answer a mathematics question aimed at primary level, then they have no hope of teaching the underlying concept clearly to the students they teach. This is intuitive and makes a lot of sense. Instead of arguing about effect sizes and lack of research on the effect of teacher knowledge (there is a massive gap), surely the profession should be working to ‘fill the gaps’ in teacher knowledge to ensure all concepts are taught well. I don’t think I’m overstepping the mark when I say that is what the community expects at a bare minimum. And that’s not restricted to mathematics, but all subject areas. This teacher clearly has acquired powerful PCK he or she can use in the classroom. Not only are they able to identify the problem at hand, they are also able to explain, in detail, how to help fix the problem. This is not general knowledge – it is specialised PCK and is the knowledge required by primary teachers. I think Dr Norton’s work shows a lot of promise and I plan to watch closely from the sidelines. In the meantime, I see no reason why individual teachers and whole schools cannot systematically work on their own CK and PCK for the betterment of their students. The teachers who know language are more likely to teach language effectively. The evidence Moats cites to back up her claim comes from a 2009 paper by Piasta, Connor, Fishman and Morrison. They found an interaction between teacher knowledge and observed decoding instruction: for teachers with strong content knowledge, more time teaching decoding skills explicitly was associated with stronger word reading gains. For teachers with weak content knowledge, more time in explicit instruction of decoding skills was associated with weaker gains. Although the study is correlational and therefore must be taken with a grain of salt, the results are telling: teacher knowledge matters, a lot. Teacher knowledge is important because quality reading instruction does not mean dabbling superficially in a variety of reading skill domains but means teaching each of them thoroughly, systematically and well. There is real power in quality instruction and it is not possible if the teacher delivering the instruction does not know language at specialist level. This is especially so for the ones who struggle the most. Teaching children to identify, remember and sequence phonemes is not easy – general knowledge will not suffice. Individual phonemes overlap or are coarticulated during speech production so segmenting phonemes is an abstraction. Many students will not gain insight into the phonemic structure of our language without being explicitly taught. Even after they gain this insight, prolonged, intensive instruction is often necessary for students to master these skills. Teachers need to know in order to deliver the necessary instruction. This is how students can quickly learn to distinguish words which sound similar, such as illicit and ellict (il meaning “not” and e meaning “out of”); and recognise when words are closely related in meaning even if they sound different as in resign and resignation. Such knowledge is very unlikely to be acquired implicitly. Teachers must know this themselves in order to teach it. So if you are a teacher, please, read this book, and give your students the knowledge they need. 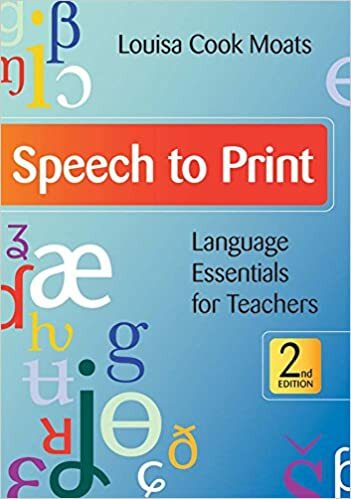 This is my second post in a series of posts on Louisa Moats’s book titled Speech to Print. Find the first here. After many hours stuck hunched over my notepad in a less-than-crowded lecture hall and even more hours spent pouring over very average lesson plans in preparation for prac rounds, I was all done and dusted and ‘ready’ for the classroom. I learned a lot during my time study, but needless to say, I wasn’t really ready. Here are 5 topics I feel are important enough to be courses in their own right and were missing in my ITE. Hard science wasn’t really a thing in my ITE. Sure, I can understand that a positivist mentality isn’t best for a teacher education course but at least some science is warranted. Learning is often misunderstood. The practices most people undertake aren’t overly effective for learning. Teachers can only benefit from knowing and understanding how memory, forgetting and retention work and how these understandings can be leveraged to maximise memory retention. If we are not taught about memory, forgetting and retention, then how are we ever supposed to make those simple changes which could make a big difference? Such findings from huge, evidence-based reports conducted by two national governments should be taken seriously. How to systematically and explicitly teach all 5 keys should be part of ITE. Not many teachers know of the debate, yet it affects their work every day. Luckily, I had one very inspirational and passionate ITE teacher who encouraged me to engage on Twitter. If it wasn’t for her passion, I would likely still be blind to it all. Teaching methods vary and not all are equal but teachers should be taught how to implement all forms of instruction – both traditional and progressive. Ideally, this course would be taken early in the ITE course because pedagogy is quite subject specific. The teaching method with the most evidence is explicit instruction. It involves directly teaching the content and skills of a subject area using clear and unambiguous language. In response to concerns about low attainment, the US federal government launched Project Follow Through, a very large and expensive study into forms of instruction. The following graph makes clear the finding that explicit forms of instruction were most effective. Its findings have been replicated many times. Some may not agree with explicit instruction on philosophical or ideological grounds, but its usefulness cannot be denied. Its principles should be taught to all ITE students. The guide on the side facilitates learning and does not teach students content directly. It is a widely accepted philosophy in Australian education. Why teachers are so ready to adopt such a view probably has a lot to do with their own subject expertise. Many teachers do not have the required knowledge to teach primary subjects effectively (Ma, 1999; Stark, Snow, Eadie & Goldfield, 2016). Guide on the side makes sense to those who do not have the necessary knowledge to teach children a specific subject. If I don’t have the required knowledge, I’ll let the students find it themselves. The guide on the side philosophy gives teachers an excuse to downplay the need for subject expertise. This is likely why it is so popular, and likely why so many teachers do not feel they need to know the subjects they teach. Intuitively, this approach seems bad, and it is. Letting Google do the job is not enough. Teachers need knowledge. Teacher subject expertise is important. As a 2008 US Mathematics National Advisory Panel report notes, “It is self-evident that teachers cannot teach what they do not know.” Content taught in primary schools may seem straightforward, but it is not so simple or easy. It should not be assumed all adults have the necessary required knowledge to teach the many concepts students need to come to grips with. So begs the question, what type of knowledge do primary teachers need? The answer is not as simple as ‘more knowledge’. Simply requiring primary teachers hold advanced degrees in the field they wish to teach is not likely to result in stronger knowledge related to topics taught at primary level (although no one is suggesting having an advanced degree isn’t a bonus). Rather, primary school teachers should be gaining expertise in the foundational primary content they will be teaching. This foundational knowledge can be split into two areas: content knowledge and pedagogical content knowledge. Content knowledge is a deep foundation of factual knowledge of a subject and how this knowledge is organised within the subject. Teachers need to know the content they will be teaching and how this is organised at expert level; a level far beyond that of the average adult. Pedagogical content knowledge is knowledge and understanding of how best to teach a subject; including how to best represent ideas, the ability to anticipate student thinking, and knowledge of common preconceptions and misconceptions. Knowing the subject is a necessary prerequisite but it not enough. Teachers also need to know how best to teach and what teaching a certain topic might mean for the students they teach. Primary teachers do teach a wide variety of subjects. To bypass this problem, primary teachers should specialise in one or two subject areas and continue to develop their knowledge over the course of their careers. Teachers who specialise can rely on each other’s expertise. This is true collaboration: professionals in a field seeking specialised advice from an appropriately specialised colleague. However, this utopia will never be realised while guide on the side philosophy continues to find favour. Teachers should adopt a specialist approach and put the guide on the side to bed. It is standing in the way of progress. A recent tweet I made about my preference for sage on the stage (SOTS) teaching as opposed to guide on the side (GOTS) teaching provoked some interesting debate. A GOTS is a facilitator of learning. They do not teach children directly; rather, they let students lead their own learning and sit back and wait for a tap on the shoulder or an appropriate moment to suggest what to do next. This is often used in constructivist approaches such as project based learning where students work together on a project, often relying on the power of Google for information as the teacher works as some kind of feedback ATM whenever the students require. They may also tweak tasks whenever necessary to ensure students meet very vague generic skill outcomes. A SOTS is a teacher in the traditional sense. They use their own knowledge to teach children concepts, ideas and key facts in a subject area. After teaching key concepts, students engage in carefully selected deliberate practise to strengthen their understanding. Crucially, students are not masters of their own fate; as the professional, the teacher leads them towards success. SOTS teachers understand that skills are built on knowledge; they cannot be taught directly and so their own knowledge is crucial. GOTS is a widely accepted position. Most teachers will gladly profess that their role is not to pass on knowledge but to facilitate a natural curiosity and love of learning. Such a view has its roots in the romantic view of the child. In a romantic view, the child is a special being with unique and trustworthy impulses that should be allowed to run free and stave off corruption from the world. This is at the heart of constructivist pedagogy manifested in the GOTS approach. Because a child is the master of their own learning, the role of teacher knowledge is played down by a GOTS. This is especially true in late primary school where GOTS is perhaps most widely used. Students now have access to a wealth of knowledge through the mighty power of Google and, therefore, do not need the limited capacities of a teacher. Being able to research something is no doubt an important skill, but it is a skill almost totally dependent on broad knowledge. It takes knowledge to gain knowledge – students who engage in research too early will not be able to filter out the true and false. To be able to use the knowledge at our finger tips, we first need a storehouse of knowledge on a particular subject. Students do not have this storehouse because, at 8, 9 or 10 years old, they are still relative novices in all academic fields. A child spells trunk as TRUK. Why has the student spelled the word this way and what can the teacher do to help the child? A student expresses 1 1/2 as . What concept does the student not understand and what teaching needs to occur? This reveals an inconvenient truth for primary teachers: if you do not have the knowledge, then you cannot teach it. Perhaps this is why GOTS is so readily accepted. Perhaps teachers who feel like they lack the knowledge to teach a subject are more comfortable adopting a GOTS approach and letting Google do the hard yards. I, for one, am not one of them. Teacher education does not equip primary teachers with the knowledge they need, but that does not mean I am going to reject my crucial role as the SOTS. We should all be working towards acquiring the knowledge we need, not rejecting it entirely. Reading failure in Australia is well documented. 1 in 5 children fails to learn to read at an adequate level. It is widely accepted that a subset of students have learning disabilities preventing them from learning to read but what of the others? There is a significant, unspoken-about and sizeable population of students with no learning disability who are struggling. They find learning to read much more difficult than their peers. More often than not, they struggle to come to grips with English’s deep orthographic code. English is rich and very beautiful, but all agree that the many nuances, a product of its long history, make it a lot more complex than relatively simpler shallow orthographies such as Spanish and Finnish. The students who struggle with the code need high levels of support with quality instruction. Explicit instruction in phonics is the most effective way to teach children to read words. Once students have the necessary phonic knowledge, they will gain access to the vast majority of written words – a necessary prerequisite for the goal of reading: to make meaning. The Reading Wars are still raging. Whole Language advocates are a hindrance to the full implementation of high-quality phonics programs. Advocates of evidence-based phonics approaches to teaching early reading are unrelenting in their pursuit of change. Such dedication needs to continue to ensure the best instruction is implemented in our schools. Response to Intervention is a rigorous approach to intervention for struggling readers. Once a high-quality, evidence-based reading program has been implemented, Response to Intervention can be used to ensure no child falls through the inevitable cracks. All students receive whole-class instruction from a knowledgeable teacher (Tier 1). Students who fall behind are detected through careful monitoring are placed into targetted, small group instruction (Tier 2). Those who continue to display low progress are then given intensive, individual instruction (Tier 3). If primary teachers do not know anything else, then they should have the necessary knowledge to implement quality reading instruction. Unfortunately, this is not the case for many teachers. This is a major concern that needs to be addressed to ensure the most children possible learn to read within Tier 1 instruction. If it is not addressed, then a Response to Intervention model is doomed to failure. No matter how good instruction is, there will likely be a subset of students who struggle to learn to read and will, therefore, need more instruction. These students do not need anything new; rather, the amount and intensity of instruction need to be adjusted to fit their needs. 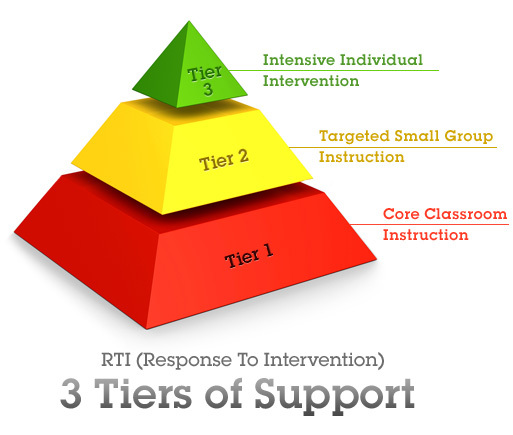 Tier 2 instruction in a Response to Intervention model seeks to address student needs through small group instruction. In the context of reading, a highly skilled teacher of reading would implement a systematic program which addresses the 5 keys to reading. Reading Recovery is a program often used as Tier 2 intervention. Reading Recovery is not an appropriate intervention for struggling readers for Tier 2 because it lacks the evidence-based approach needed to be most effective; lacks evidence of impact; and, as a one-to-one intervention, is not likely to be cost- or time-effective. Minilit, a program designed for Tier 2, is a good example of a program fit for purpose. Most students will benefit immensely from a well implemented, high-quality Tier 2 program lead by a strong teacher of reading. The students with the highest needs will still require more instruction beyond Tier 2. Students with the highest level of need require very intense and targetted one-to-one instruction. Tier 3 instruction is one-to-one instruction for these students. Ideally, the same, strong teacher who implemented Tier 2 instruction will also implement Tier 3 instruction. The students who reach Tier 3 are finding reading extremely tough. For many professionals, parents and policy-makers interested in early reading instruction, it is these students who drive their passion and advocacy. These students are never likely to read the most complex of novels or most detailed academic papers without strong, timely intervention. They should not be doomed to failure because schools and systems refuse to adopt evidence-based approaches and fail to implement necessary interventions to support them. We can do better. Response to Intervention is a model designed to help these very students and should be given consideration.